Jute is main business of the Group.Cheviot Company Limited is the flagship company of Group Cheviot. It owns Cheviot Jute Mills in West Bengal. It manufactures Jute fabrics and Jute shopping bags.The company is recognized as trading house by Government of India. It also creates Hessian bags, Sacking bags and Jute fibers.The company is trying hard to popularize decorative Jute based products ( as a replacement for non environment friendly Plastics). Cheviot International Limited is a 100% Export Oriented Unit of Group Cheviot.It supplies quality leather garments to leading brands of Europe.This company is based in New Delhi. The third and last area of operation is tea.Cheviot Agro Industries Private Limited owns the 1500 Hectares Tea Garden, Binnakandy Tea Estate, in District Cachar, Assam. It mainly sells tea in bulk order. It has also launched its own brand Golden Horse tea. It is mainly targeting the black tea market as of now. As mentioned above Jute is main business for the Company. The Jute industry in West Bengal is struggling for long in India. Many companies have shut down. It will be interesting to see how this company has performed over the years. Also it has eliminated pure dependency on Jute by exploring Leather and Tea sector. 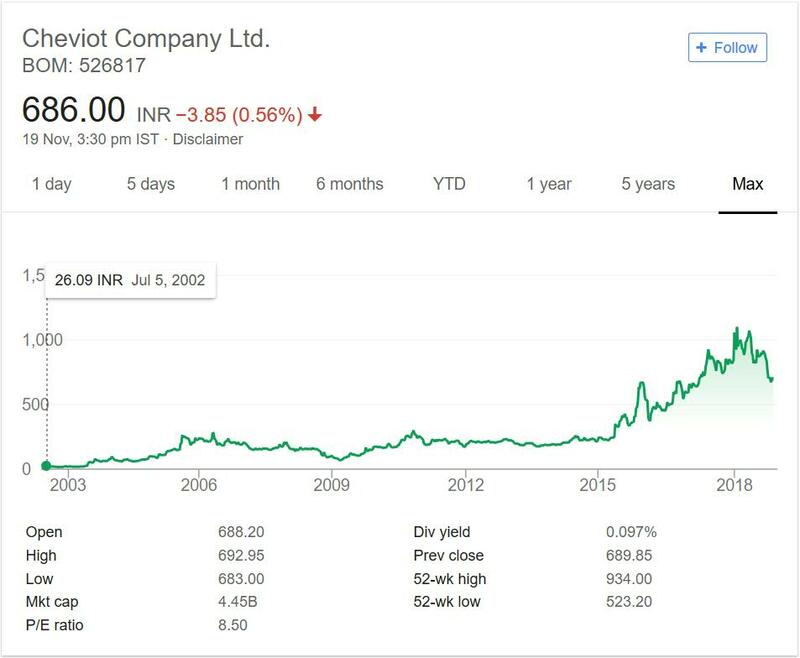 Below is stock price chart for the company in past 15 years or so. I have taken long duration to eliminate any cyclic fluctuation in prices. It will also give you fair idea of company performance over the years. In year 2002 Company was trading at 25 mark. It made steady progress after that till year 2009 (note the prices were impact due to 2008 crisis). But after the crisis was over the performance of Company was steady. It was consolidating in 150 to 250 range for nearly 6 years. As you might have seen with most stocks the bullish run recently after 2014 pushed all stocks to new heights. Cheviot was no exception. It moved past 1000 as well just before 2018. The recent correction has pushed the prices down to level 700. The best part of above stock price chart is that company was able to beat the lean dying Jute industry. It has tested the tough times and emerged as winner by diving its portfolio and also innovating ways to promote Jute products. The dividend of Company is not that great but it has appreciated well in price. With steady rise in prices and never really made loss for investors. The stock rose to 50 times the price in year 2002 in nearly 15 years. This is exceptional in all sense. Cheviot company is in portfolio of Vijay Kedia. He is one of the top investors in India.The company has performed well for investors over the years. The niche in which Cheviot operates is unique. You can find multiple companies in tea sector and leather sector. But Jute sector does not have much representation. There are many companies but Cheviot has outperformed the sector. So it can be seen as flagship company of Jute sector with operations in other verticals as well. Since Leather is mainly export only item for Cheviot and tea is for internal consumption (black tea variant) it has unique blend in business fields. All these consumption items have good growth rate in future as well. Indian Government in past have given indication to promote Jute industry by promoting Jute products and curbing usage of plastic items. Plastic carry bag ban is one such step which will boost Jute Industry and Jute based bags. Since Cheviot is front runner Jute company any measure to promote the industry will boost the company and the effect will be seen in share price.So in my opinion it is an interesting company to keep an eye on. So you can add the company to your stock watch list. Cheviot Company is one of the leading Jute company in India listed on exchanges. It has same challenges which Jute industry is facing currently. So far based on previous price performance it seems company has performed and overcome the challenge. It would be interesting to see how well company will perform in future and whether Government can come up with policy to boost the industry.